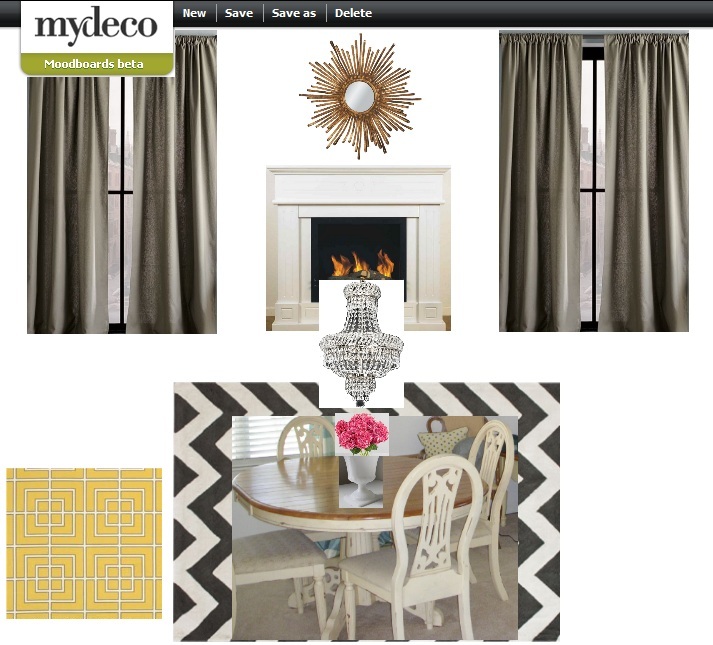 Mix and Chic: A client's living room and dining room project! I just wrapped up another client's project recently. 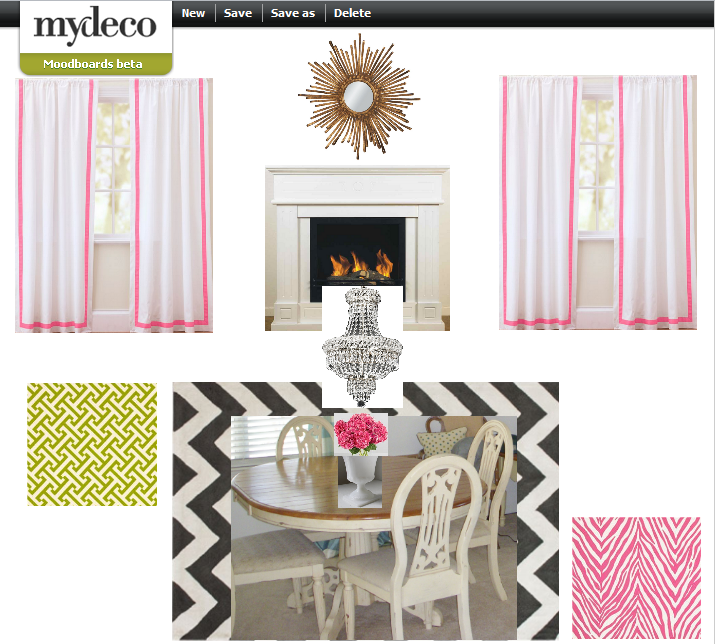 Remember the online room design giveaway I did during April? I had two winners and one of them is Lilli from Blushing Cheeks. She asked me if I would consider her living and dining space as one area or if I am going to focus solely on her living room for the design collaboration. I told her that I would normally consider that to be two separate rooms for paying clients but because it is a giveaway for my readers, I volunteered to help her with both spaces. 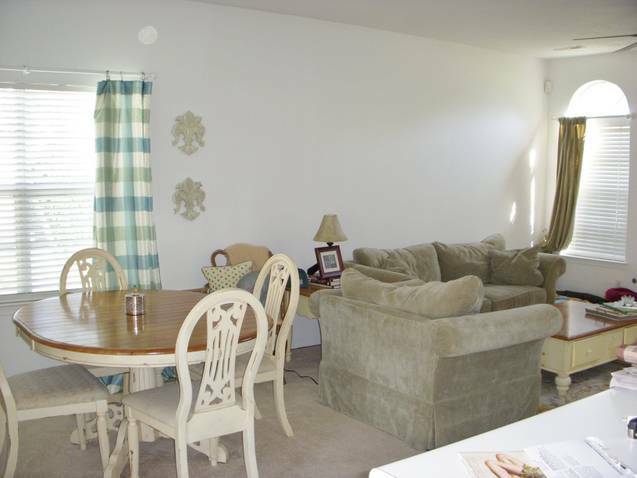 Lilli's living and dining room area are quite neutral. In her questionnaire, she told me she couldn't paint the walls because it is a rental unit. She is also tired of the country and vintage look. She loves shabby chic but she is bored with the cream. When both rooms are completed, she wants them to feel casual yet elegant, current and with a modern glam vibe. She likes greens, pinks, whites, creams, silvers, corals, yellows, turquoises and light blues. 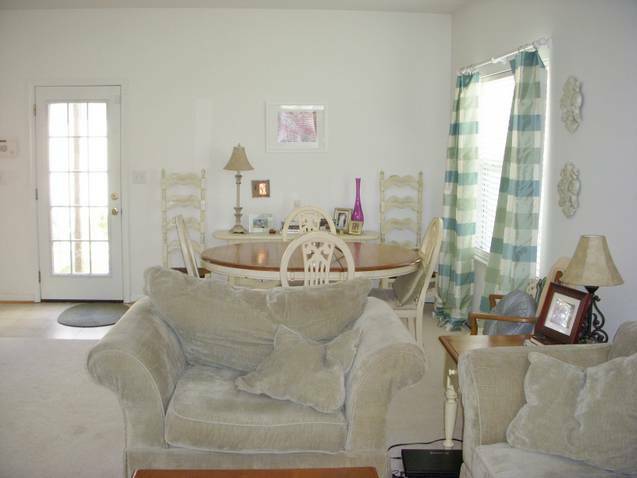 Everything can stay or go except for the furniture and crystal barware. Here are the moodboards I created for her. From the pictures of her living room and dining room she sent me, I thought her furniture layout for tv watching is slightly inconvenient so I suggested that she switched both rooms. 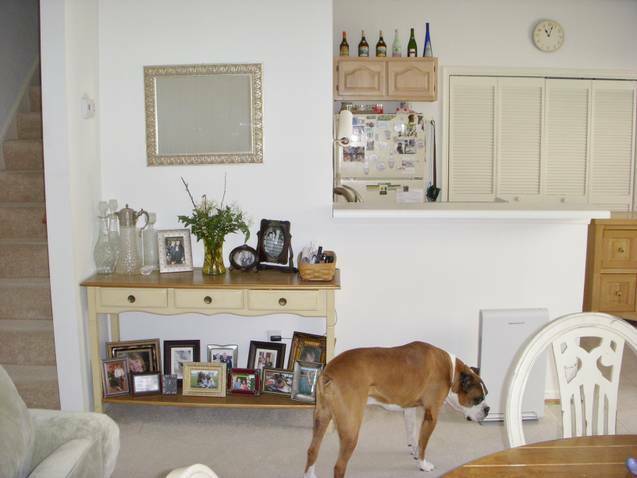 Her entertainment unit will be relocated along the wall where the door is and her sofa will be placed directly opposite her entertainment unit. Since she got tired with all the cream but still wanted to keep all her furniture, I suggested that she paints them in turquoise, her favorite color, then distress them to achieve the shabby chic look she is after. 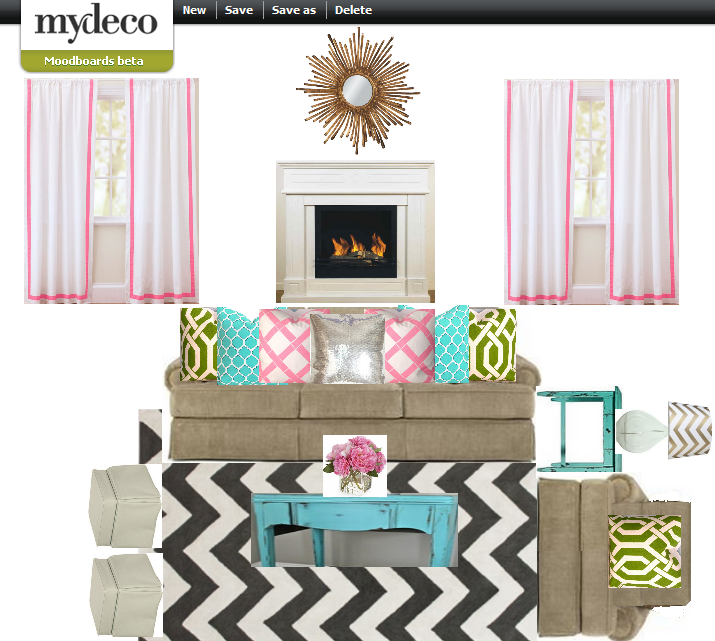 She is a fan of chevron rugs so I picked a stylish gray and white zig zag rug for both her rooms. I selected a silver sequined pillow for her sofa and an inexpensive starburst mirror above the fireplace mantel to give her that little bit of glam she is looking for. Since painting the wall is not an option, I try to incorporate more colors in the accessories to break up all the neutrals. I picked a fresh color palette that also comprises all her favorite colors to keep the rooms looking modern and updated. 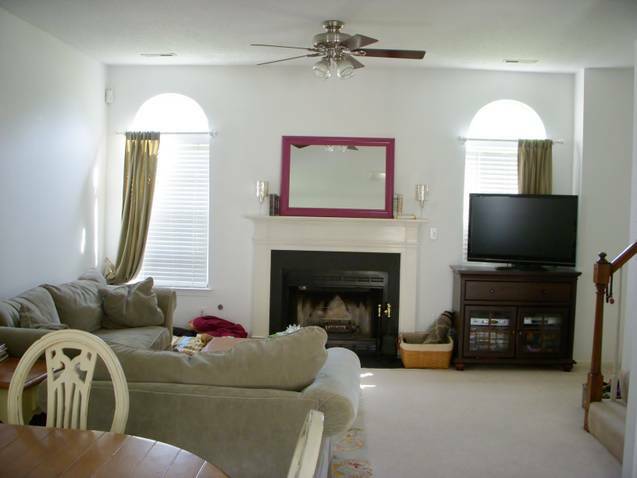 After switching both rooms, the dining room will now have a fireplace. I suggested that she uses a beautiful green geometric pattern fabric as the table cloth to introduce more colors in her dining area. I also sent her a few fabric options for the dining chair seat because she intended to reupholster her dining room chairs for a fresh new look. She loves pink and animal stripe motifs so in the end, that is what she picked. In her inspirational pictures, she showed me a lot of colorful rooms with high end crystal chandeliers so I knew I needed to get her a crystal chandelier for the wow factor. 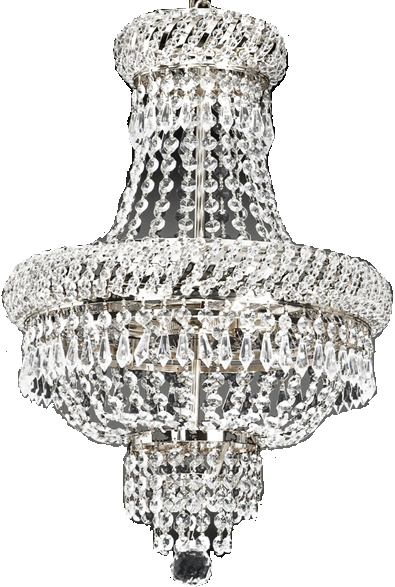 After browsing online for a while, I found a website with many inexpensive real crystal chandeliers. I gave her a long list of my favorites and in the end, she picked this. Isn't this chandelier gorgeous? It is elegant, glamorous and surprisingly budget-friendly which costs less than $200. After switching both rooms, her new dining area will be quite bare so I suggested that she relocates her console table to the wall where she puts her sofa now to create a new vignette. That way, she can still display her barware on the console table and at the same time, add some visual interest on the blank wall without spending a lot. I sent her the moodboards after they are completed and I was thrilled when she told me she loved it. She also showed her friends the moodboards. All her female friends love it except her husband. Apparently, he is not a fan of feminine colors and bold patterns. So, I asked her to get her husband's input and suggested that he picked a few inspiration pictures for me. In order to make any necessary changes, I needed to know what he likes. In the inspirational pictures that he sent me, the images has bright and cheery colors with minimal patterns and a little bit of gray. I made a few changes to my original moodboards but still kept some of the elements that Lilli was after. The second time around, she told me she wanted to repaint all her furniture in white and ditch the shabby chic look so I picked all white furniture in my moodboard to show her how everything would work with all the new changes. She said she wanted to repaint the table so we took the table cloth idea off the moodboard. I picked a nice yellow geometric fabric for the dining chairs to replace the pink striped fabric. What do you think of both moodboards? Which versions do you prefer? The first version or the revised version? Personally, I like the first version more because you know me, I am a big fan of colors and patterns. I also love the pillow combinations as well. 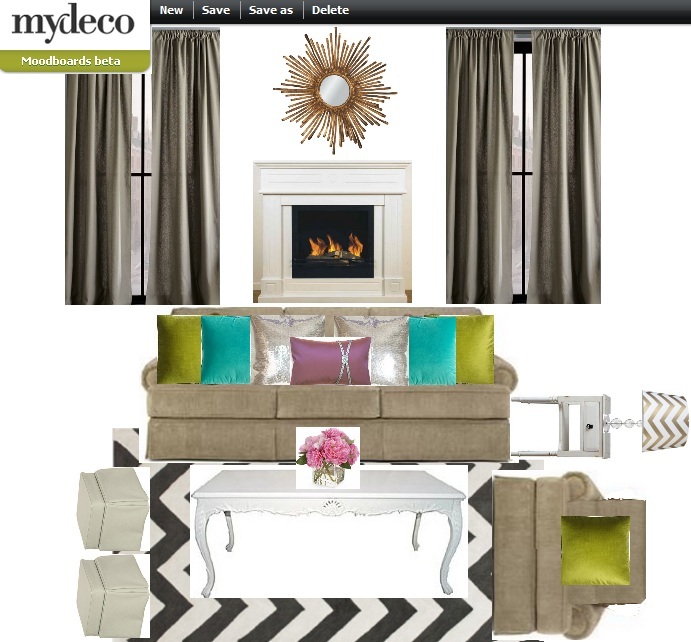 During this design collaboration, I have discovered a new color scheme that I loved! The hot pink, bright turquoise and green color combo is youthful, fun and fresh at the same time and I hope to incorporate this color palette when I get a chance in the future. 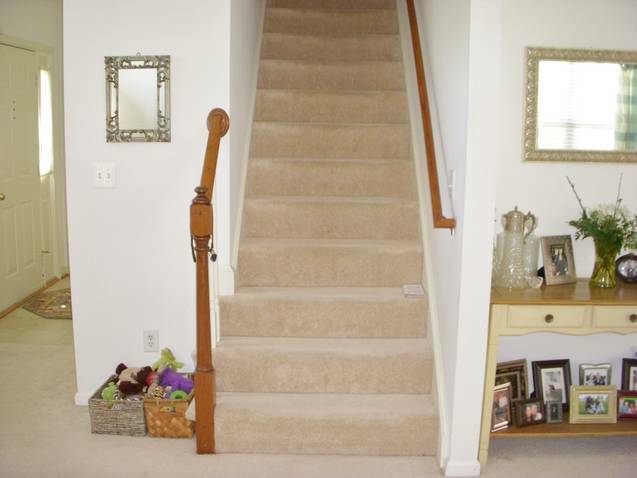 I am looking forward to see Lilli's living and dining room makeover. I am sure you are excited to see the final outcome of our design collaboration as well. I promise to share any updates and progress on Lilli's home as soon as I can so stay tuned and check back regularly! I kind of like them all. I like so many different things though so it's always so hard for me to narrow my decision. Anyone of those will look lovely. You have done a great job accomodating her needs and likes as well as her husband's. It is always important to keep in mind al the occupants of any space. Exciting project, Jessie! Love the color and pattern you've injected into the space. Great job, Jessie! Hmm, I think the 2nd one. The first is great and fresh, the 2nd has a bit more of the elegant look. Can't wait to see the final! You did such a great job on these designs Jessie! They both are gorgeous, but I'm with you the first is my favorite! Those colors are fantastic together! What a lucky client; you really spent a lot of time designing two gorgeous rooms for her. Can't wait to see the end result. Have a great weekend!! I think they both look great, but I agree with you - I prefer the first one. Cant' wait to see how it all comes together!! OOH Jessie, I totally agree with you and with the readers the first one is totally my favorite. I would die to have that design. But hubby spoke up for the first time in his life about decorating. So I had to compromise. But I love the compromise too. I could always give the husband the boot. hee hee. Thanks so much Jessie for all your time and hard work. I got my mirror today and put it up. yay.